Whenever the need arises to fuse pipe, you can almost guarantee that the name McElroy will be one of the first choices. With a history of creating some of the most powerful machines in the industry, McElroy is known for being reliable and getting the job done. In case you’ve missed our previous blogs about them, we’re here to tell you more about the McElroy Rolling 618 Fusion Machine and the Rolling 412 Fusion Machine. 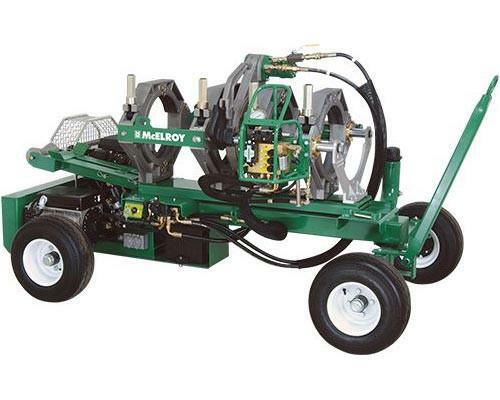 The Rolling 618 is among the most well-known and popular of McElroy’s various fusion machines. It fits the space between large and small diameter fusion and it can fuse pipe from 200MM to 450MM (8″ – 18″). Some of its features include an easily removable universal four-jaw carriage plus an outer fixed jaw and skid that can also be removed if the machine needs to be used in a situation where space is limited. The 618 can also fabricate segmented ells with the option of DataLogger friendly mitered inserts. As the first fully self-contained fusion machine to ever be built in the world, the McElroy Rolling 412 already has its place as a part of history. The machine has been improved and fine-tuned to the point that it can now be purchased with the option of electric or gas power. It features a wheeled chassis that makes the machine easy to maneuver.